The branch hosted its end of year function on 30 November 2018, the first since the new committee took over in October 2017. The evening began with a technical presentation hosted by Quintin McCutcheon from Schneider Electric. Quintin presented on Artificial Intelligence and as per usual was an extremely animated and engaging presenter. Members and guests thoroughly enjoyed the presentation and were excited about the future prospects associated with AI in the industrial sector. The presentation included a brief history of AI and related the increase in development to data volumes, advanced algorithms, improvements in computing power, networking and data storage. It also included a number of entertaining AI videos. Next stop was a brewery tour at the main Devils Peak Brewery in Goodwood where tour guide JC Steyn, the head brewer at Devil Peak, walked us through the entire facility and related the story of how the brewery originated, and how it has developed into one of the most high-tech craft breweries in South Africa. Initially it was started on small premises in Somerset West by Greg Crum with a maximum capacity of 6000 litres a month. 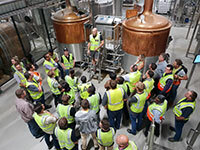 As demand grew it relocated to Salt River in Cape Town, and later to its current facility Gunner Cir in Goodwood, which allowed the brewery to expand the range of beers produced and also to experiment with specialist and limited-edition varieties. Members and guests then retired to the Tap Room, for snacks and welcome beverages. All in all, it was a great evening of knowledge and networking. 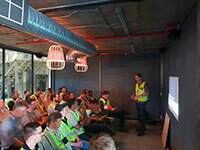 The branch thanks Quintin McCutcheon for his informative presentation and JC Steyn for the Devils Peak Brewery tour.